Michigan's got a lot of amazing things to see and do, but we've been a bit remiss. While we've shown you hiking trails, the very best music venues, delicious restaurants and just about anything in between, we have shown you nothing for your best friend: Your dog! So now, let us fix this oversight by offering those with dogs a great chance to get away, run and play, as we look at 10 great Michigan dog parks! 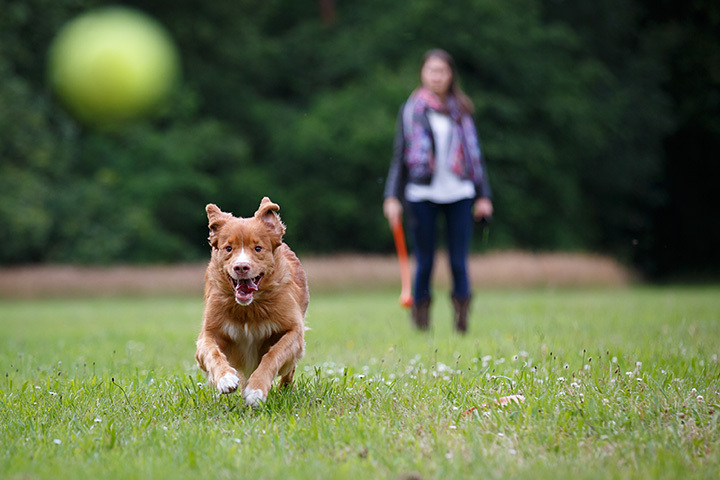 Hit Grand Rapids with your dog in tow and head to Hillcrest Dog Park. Hillcrest features separate areas for large and small dogs, so there's little cause for alarm if a Pekingese should decide to swing above its weight, so to speak. With a seasonal water station, cleanup bags on hand, and benches available for pooped humans, Hillcrest has just about every basic a dog park goer could ask for, no matter how many legs he has. This little wonder in Vicksburg is a case of getting what you pay for. Though there's a $5 daily admission fee—an annual park pass is available for the cost of five visits—but users get plenty in return. A special section for dogs under 25 pounds, a grass area with shade trees, a complete walking trail through the woods and even some access to water—it's not far from Gourdneck and Hogsett Lakes—there's no shortage of fun and excitement for dog and human alike. Head out to Royal Oak for a taste of the dog's life, and enjoy a special part that features a leash-free zone. The downside is that the area is unfenced, so make sure your dog is ready for such a development before letting him loose. With plenty of open space, and no shortage of trees (and thus sticks to fetch) there's a lot to do and a lot of space in which to do it. Perhaps the most unique entry on the list, this is one of a comparative handful of corporate dog parks out there. Joey's Pet Outfitters in Williamston offers access to a complete pet store alongside its dog park. The park is in its soft open as of last August, so leashed dogs only for now, but the park is also taking public recommendations for future expansions, so anything that's not on hand will likely be before too much longer. An excellent example of repurposing a structure, the Ottawa County Dog Park in Holland is actually set in the Ottawa County Fairgrounds. Despite this, there's still seasonal running water on hand for the dogs, and separate areas for large and small dogs. There are even some off-leash areas, making this one of the better dog parks around and one of the most distinctive thanks to its location. Part dog park, part training course, the E-Z Dog Park and Training Center in Howell offers a great experience for the dogs. An eight-acre, off-leash park that features not only inside and outside areas, but also a large pond for the dogs that favor a swim. Just to round it out, it's also a great way to get an education with a dog, as it's not just a dog park, but it also offers training classes to give a dog more skills or just improve attitude in general. A lot of Bay County Dog Park, found not too far from Bay City, is about what you'd expect from a dog park visit. There are agility items on hand, as well as benches and shaded areas, and there are off-lead areas as well to let eager pups run free. What easily represents the centerpiece of the Bay County Dog Park, however, is the three-level water fountain which makes a quick drink readily accessible to breeds of all sizes, as well as their owners. In Frankenmuth, there's a Bavarian twist to just about everything, and it's no different in its dog park. A fenced-in half-acre, Hund Platz—“dog park” in German—offers not only a park with some fairly impressive floral displays, but also some dog agility equipment, making this essentially a complete playground for dogs. Visitors are advised to bring their own water, however, and a slate of other rules can be found at the park's website. Looking for a pretty high-end dog park that features no-leash options? Head on out to Saugatuck for the Tails and Trails Dog Park, which will provide pretty much what the name lets on. With grass, sand and shade portions, and an area completely fenced in, dogs will be able to cheerfully run and play to their heart's content at Tails and Trails. A sign out front notes that no aggressive dogs—nor people—will be tolerated, so prepare for a relaxed day out. It's easily one of Michigan's more upscale dog parks. Found in Portage, the Bark Park boasts a four-acre fenced-in environment, complete with a special area for small and/or shy dogs. With a $5 cost for a day pass, and discounts available on a monthly or annual basis, there's quite a bit to do here. For those who want to leave the dog behind to enjoy the park alone, day care options are available Monday through Friday, and they even have a set of dogs on hand to play with your dog in a supervised fashion. View more Michigan Dog Parks.